Mitch worked very hard on the next project. 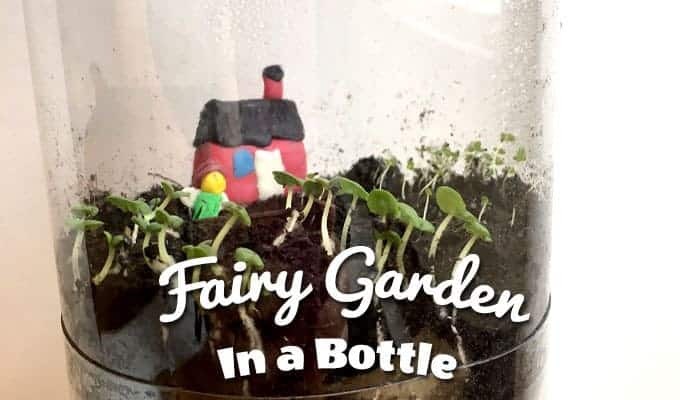 He made a teeny tiny house from clay so we could bring you a DIY fairy garden terrarium made from–get this–a soda bottle! You might recall that we’ve done this project a couple summers ago and called it the Soda Bottle Green House. Since then I’ve been wanting to put together a fairy garden–especially since our recycled fairy house was so much fun! But you can’t really fit a milk carton inside a soda bottle and still have room for plants, so we pulled out our shrink ray! 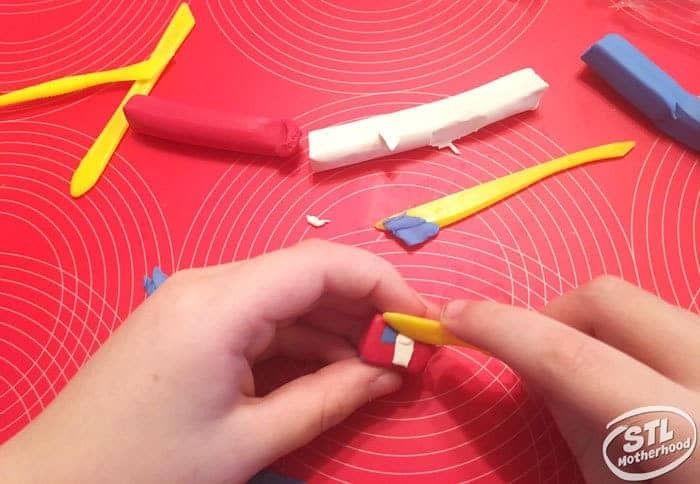 Mitch has been having a lot of fun with sculpting clay, so I asked him to make the smallest house he could. Nice job, don’t you think? After constructing the soda bottle garden, we added the house and my tiny fairy, then planted the seeds. The sculpting clay is holding up well to the damp environment and looks pretty cool too! This is the perfect time to make a soda bottle green house. Spring is just around the corner and seeds are now for sale at your favorite garden center. 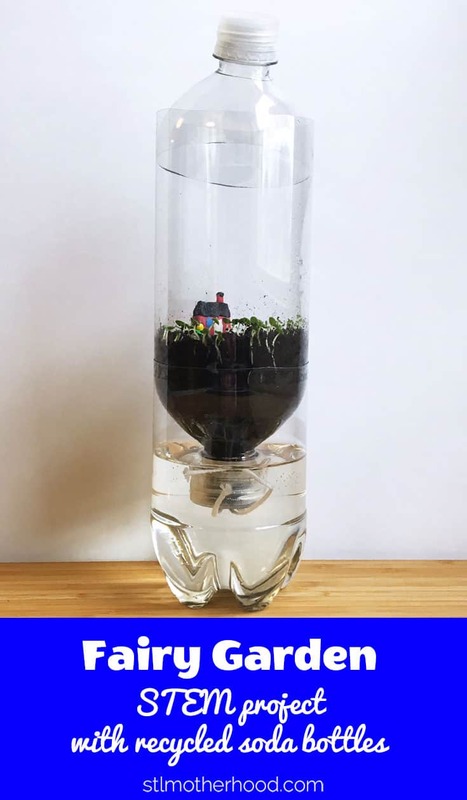 All you need are a couple soda bottles, wicks (from the candle aisle of the craft store), dirt, seeds, scissors and a drill (to put a hole in the cap). The full directions are over here at Soda Bottle Green House. Last time we used two 2-liter bottles , but this time around we used smaller 1-liter bottles. The new terrarium is smaller and fits nicely on my windowsill. 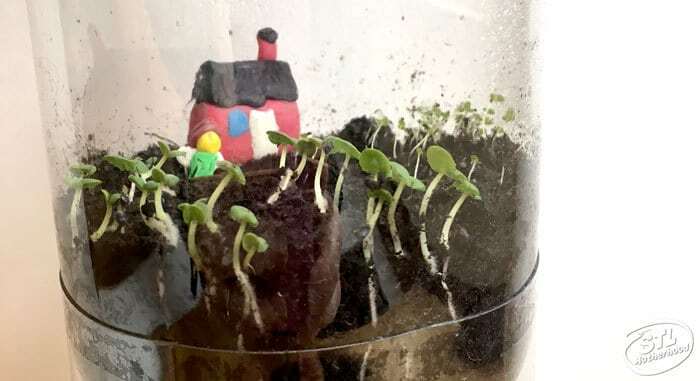 Pretty soon the basil we planted will grow bigger than the little fairy farmer inside, so I’ll keep updating this post with pictures! Want more green growing experiments? Then check out this one where Mitch grows…and names…a potato.